Square (NYSE: SQ) traded 4% higher on Tuesday morning, after Citigroup upgraded the mobile payment company from neutral to a buy rating. 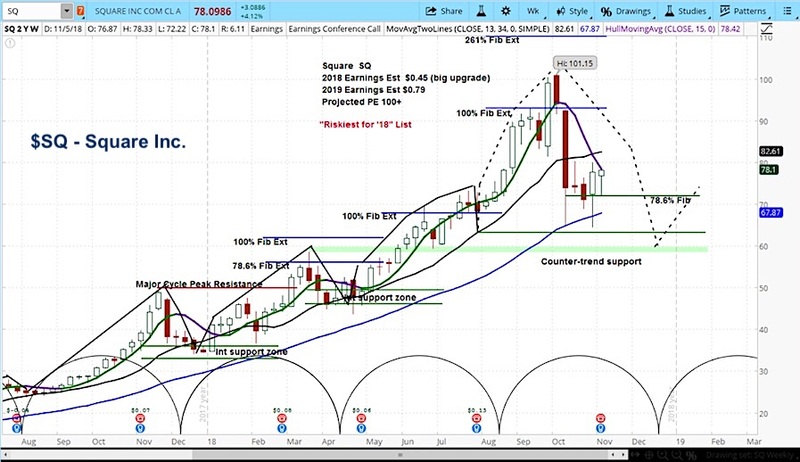 However, our analysis of the stock’s market cycles indicate that downside risk will persist for Square (SQ) before it is able to move higher again. Analyst Peter Christiansen recommended that his clients buy Square’s stock, raising his price target from $67 to $90, which represents a 20% premium from yesterday’s closing price. Noting the strength of Square’s ecosystem and user growth, Christiansen points out that SQ’s recent weakness is largely due to the departure of former-CFO, Sarah Friar, who took a position as CEO of startup, Nextdoor. “Given Square’s category leadership and high profile, we believe it is well-suited to attract a talented CFO to help lead the company in its next phase,” explained Christiansen. Looking at the the market cycles for SQ, we believe Citi is wrong with respect to the timing of its call. Our view is that the likely scenario is for more downside risk, as the stock is still in the declining phase of its current cycle. As such, we see SQ taking a trip back to $63 by year end.